Are Multiple Offers Slowing for Vancouver Condos? Vancouver condos remain red hot, however the number of sales sold above asking price is now on a 3 month slide. When a condo sells above asking it can generally be assumed it received multiple offers. Of course when a unit sells below asking price it does not necessarily mean it didn’t receive multiple bids. Yes, sales above asking price is not a perfect science, but it’s an interesting metric to keep track of. In September, 43% of Vancouver West condo sales were sold above asking price, a slight drop from 45% in August. 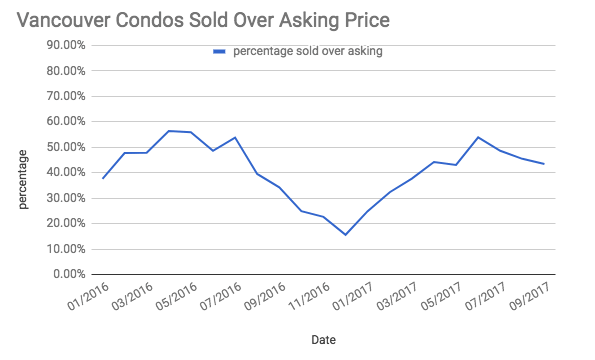 43% of Vancouver Condos Sold Over Asking Price in September, 2017. Obviously this number is still ridiculously high but the 3 month slide does point to a bit of a slowdown, albeit partially seasonal. The sales to actives ratio still sits at 53% which is well above the 20% needed to be considered a ‘sellers market’. This tends to put upwards pressure on prices, which we’ve seen with Vancouver condo prices up 13% so far this year. As I have said for a long time, follow the sales to actives ratio to assess the temperature of the Vancouver Real Estate market. 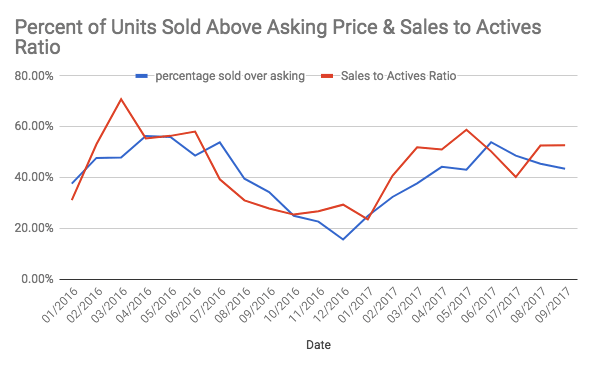 In fact, there appears to be a very close correlation between the sales to actives ratio and the number of sales above asking price.